Sweat transfers to the Gielgud tickets on sale now! After spending two and a half years interviewing residents of Reading Pennsylvania, Lynn Nottage decided to pen a play to tell the story of one of the poorest towns in America. Her striking dramatisation of this rust belt town fallen on hard times would go on to win her a Pulitzer Prize. After a sell-out run during its UK premiere at the Donmar Warehouse was met with critical acclaim, the show transfers to the West End's Gielgud Theatre. Sweat tickets are sure to be in high demand, so book yours early! Reading Pennsylvania was a town where people worked hard all day and drank hard all night. They went straight from high school to a job in the mill or the plant and worked there for the rest of their lives. Sweat tells the story of a community devastated by automation and the collapse of industry. We see three friends over drinks at their local bar and watch the dynamics of the town, and their relationships change through promotions and pay cuts, strikes and scabs. The lines between friendship and violence, love and hate, racism and prejudice shift and blur in this compelling tale of the American dream turned nightmare. The tale shifts between 2000 and 2008, in a small East coast city, but in these times of Trump and Brexit the story hits shockingly close to home. In addition to an incredible story, the Donmar Warehouse run of Sweat featured some exceptional actors which meant Sweat tickets sold-out in no time. It is not yet confirmed if the entire original cast will be making the transfer, but the Gielgud Theatre cast is sure to wow audiences. The original run of the show starred Clare Perkins (Emilia, Mrs Dalloway) Leanne Best (The Human Voice) and Martha Plimpton (The Good Wife, Pal Joey, Other Desert Cities) as the circle of friends with Sule Rimi and Patrick Gibson as sons of two of the women. Critics were wowed by Stuart McQuarrie's performance as Stan, the bartender. They were joined onstage by Osy Ikhile, Sebastian Viveros and Wil Johnson. Casting for the Gielgud Theatre run of Sweat will be announced in due course. Lynn Nottage is a two time Pulitzer Prize-winning American writer. Her work often spotlights marginalised communities. Perhaps her best-known work is Intimate Apparel which tells the story of a woman living in a boarding house who makes her way in the world sewing for women from all walks of life, but who dreams of something more. Since its premiere in 2004, Intimate Apparel has become one of the most produced plays in The United States. In 2009 Nottage earned her first Pulitzer Prize for Drama with her work Ruined which tells the harrowing tale of Congolese women fighting to survive their country's civil war. In 2017 Sweat earned her a second Pulitzer Prize, making her the first and only woman to hold that distinction. 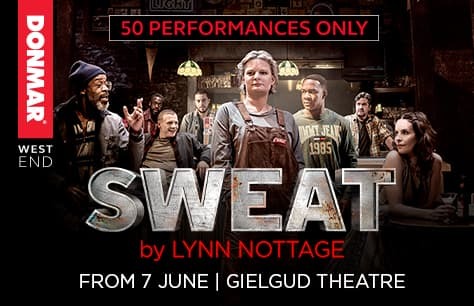 Tickets for the Sweat transfer to the Gielgud Theatre are expected to be in extremely high demand. Book Sweat tickets early to guarantee the best seats at the best prices. All persons under the age of 16 must be accompanied by and sat next to the accompanying adult. They may not sit on their own within the auditorium. If children do have separate seats you could be refused entry. All persons entering the theatre, regardless of age, must have a ticket.